Many people and organizations across the country are coming to the collective realization that for organizational & community transformation to occur, no one can do it alone. In order to realize impact, we need to work together to identify and act on shared goals that move us toward the collective mission of health and well-being for everyone in our community. In working together to achieve results for all of us in powerful and cost-effective ways, we can build on a lesson many of us were taught as children — that an ounce of prevention is worth more than a pound of cure. To learn how to get beyond the symptoms we see in our communities –to understand what’s really underneath, causing the problems we see – we need to learn methods for getting down there to the root causes. What’s in the way of preventing problems or of dealing with them before they get worse? How can we effectively eliminate problems so that they don't resurface? What works to enable us to dig down to and act on the root causes? And what does it take for us to really work well together? We’re excited to share a whole set of tools that help communities strengthen their abilities to work this way. Together, across projects and over time, we build community ownership and momentum for change. With the goal of providing consultation and support that is just the right size to every locality, we use tools that are customized to the needs and strengths of your community. Step One: Define priority improvements in operational terms. Step Two: Assess observable, measurable strengths and gaps. Identify root causes and general remedies for priority gaps. Step Three: Plan quick wins, mid-term, and longer-term improvements. Step Four: Implement action plans while managing communication and capacity. Step Five: Monitor progress, impact, and lessons learned for accountability and on-going adjustments. 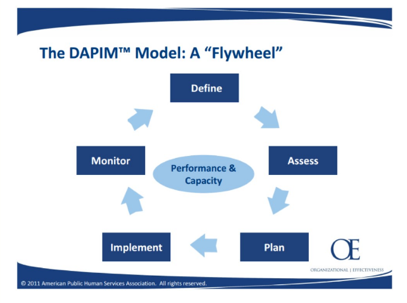 Organizations experienced in the DAPIM™ approach use it to continuously improve everything they do, no matter how big or small. At any given time they may be engaged in a multi-year “big DAPIM™” improvement effort to make fundamental improvements to practice while running multiple “little DAPIM™'s” to eliminate inefficient processes, respond to unexpected shifts in the environment, overcome obstacles, etc. In this way, an organization can be doing work associated with any and all steps of the DAPIM™ approach at any given time. Take a look at the overarching framework, guiding principles and some theoretical underpinnings for our organizational effectiveness practice.